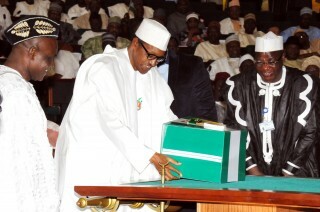 The Nigerian National Assembly has declared that the nation’s 2016 revised budget will be passed on March 17, 2016. “We should be able to lay our report of the 2016 Appropriation Bill before the House and the Senate on 16th of March,” Abdulmumin Jibrin, who chairs the House of Representative budget committee, said. He also stated that the parliament was expected to finish with the budget’s contents by the end of the following day, thus a safe conclusion of March 17th for the passage of a revised budget. This appears to be headway for the Nigerian parliament, having witnessed disagreements over the budget in a bid to remove all ambiguities last month. The repairs and renovation of existing structures are among the obviously inflated amounts in the proposed budget. From Buhari’s request for N1.4billion houseboats to the proposed amount for the State House Clinic and the N4,906,822 proposed for Vice President Osinbajo’s books, alongside other misplaced priorities should have been reduced or scrapped by the National Assembly. The proposed N22,321,880 budgeted for Aso Rock rent is the most bizarre of all allocations. The first thing on everybody’s mind questions to whom the presidency is paying rent to, making it important for the National Assembly to scrap this allocation. Similarly, a reduction of the N436,054,626 allocated for meals, canteen/kitchen equipment, foodstuff and catering materials for the president and the vice president, as well as a review of the N252,848,397 allocated for sporting and games equipment for members of the Presidency, State House and Office of the Head of Service of the federation. Despite receiving criticism on the amount allocated for the acquisition of brand new cars and fleet maintenance equipment by the National Assembly, the huge amount for the purchase of cars is not expected to resurface following Lanre Shittu’s confirmation of delivery by the Senate. The revised budget must deal with the proposed budget for the National Institute for Oil Palm Research (NIFOR), Federal College of Fisheries and Marine Technology), among others with a repetition of the same line items with different allocations. Similarly, unwieldy allocations by the National Library which allocated N5,021,254, each, for the following items: books, printing of non-security documents, cleaning and fumigation services, cooking gas/fuel cost, transportation equipment fuel cost, refreshment and meals, medical expenses, sporting activities, and direct teaching and laboratory cost, should be removed. A review of the 2016 budget revealed different prices were quoted for the same item by different agencies and parastatals. The revised version of the 2016 budget is expected to have the same price for same items, specifically in regards to the quote made for a unit of Toyota Hilux vans for various federal government colleges across states and some ministries.